Abel Montúfar was among at least 136 politicians across Mexico who have been assassinated since last fall. More than a third were candidates or potential candidates. His election campaign for state Congress was only hours old when he started to receive the threats. Sometimes they came by text, other times in phone calls, with an unidentified voice on the other end of the line. The messages were always the same: Abandon the race or you will die. Abel Montúfar was defiant, his brother said, telling his tormentors, “I am not afraid of you.” But on May 8, nine days into the campaign in Mexico’s Pacific Coast state of Guerrero, his body was found slumped in his parked van. He had been shot six times. While Mr. Montúfar’s killing remains unsolved, his relatives say they have no doubt who was responsible: criminals supporting a rival candidate. Mexicans vote Sunday for a new president and to fill more than 3,400 local, state and federal posts, making it the nation’s largest general election ever. It is also perhaps the most violent electoral season in modern Mexican history. 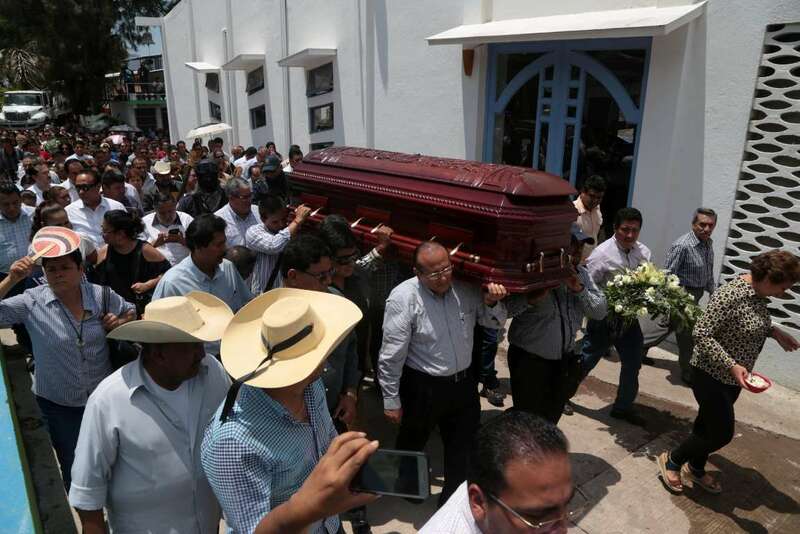 Mr. Montúfar was among at least 136 politicians and political operatives who have been assassinated in Mexico since last fall, according to Etellekt, a risk analysis firm in Mexico. More than a third were candidates or potential candidates — most of them running for local offices. Others included elected officials, political party members and campaign workers. In the long run-up to the vote, much of the national and international focus has been on the presidential contest. Yet for the millions of people living in the most violent parts of the country, elections for local office may have the biggest impact on their daily lives. And organized crime groups have all but decided many of those outcomes already. “No one has been more active during these campaigns” than these criminal groups, said Alejandro Martínez, a top official for the center-right National Action Party in Guerrero, one of the poorest and most violent states in Mexico. Scores, if not hundreds, have abandoned their candidacies out of fear for their lives. Some parties have not been able to field nominees willing to contest certain posts. Some candidates have been forced to travel in armored cars flanked by bodyguards and to wear body armor in public. In parts of the most violent states, threats have made campaigning impossible. “You have to be a little crazy to run for office here,” Mr. Martínez said. Collusion between politicians and criminal organizations in Mexico is not new. But over the past decade, criminals have increasingly sought to co-opt local politics by trying to influence the electoral process, using violence to effectively handpick slates of candidates. With cooperative officials in key local offices, criminal groups have been able to better protect and grow their illegal enterprises by exerting control over local police forces, securing lucrative government contracts and demanding hefty percentages of municipal budgets. This trend has been no more evident than in the lead-up to Sunday’s elections. In addition to the killings, more than 400 other cases of aggression against politicians and political operatives have been reported this season, including assassination attempts, threats, intimidation and kidnappings, according to Etellekt, which collated information from government, academic, civil-society and news media reports. Cases have been reported in at least 346 municipalities across the country. This shadow campaign by organized crime, almost entirely unfettered by the nation’s weak and corrupt law enforcement and judicial systems, has come amid record violence in the country, which, in turn, has been a central theme in the presidential contest. The problem has worsened amid seismic shifts in both the criminal economy and Mexican politics. The government has had a longstanding strategy of attacking organized crime groups by taking down kingpins. The approach was based on the belief that by cutting off the head of a criminal organization, the body would wither. But the tactic has, instead, served to fragment large, criminal enterprises into smaller groups that are more violent and more local. Before, the large groups were mostly focused on drug production and smuggling, but the smaller, more volatile groups have branched out into a wider array of crimes such as extortion, kidnapping, prostitution, illegal gambling and fuel theft. With their businesses focused on more local concerns, the newer criminal groups have an increasing need for collaboration with local officials. The fracturing of the criminal landscape has come alongside the fracturing of Mexico’s political landscape. For 71 years, until 2000, the nation’s politics were a one-party monopoly. Both the party and organized crime were monolithic and rigidly hierarchical, and collusion between the two often occurred at the upper levels. But as the one-party, top-down political system fractured into a pluralistic system, with more competition within and between political parties, more power and influence flowed to the local level. Securing leverage over the mechanisms of local governance and politics became crucial to the new, locally focused criminal groups, and they started to seek control over the electoral process. “The groups are not just looking to link up with candidates, but they’re looking to nominate candidates,” said Eduardo Guerrero Gutiérrez, a security analyst at Lantia Consultores in Mexico City. So, even as Mexican democracy on the national level has continued to evolve, room at the local level for free and open elections has seemed to shrink. Most of the violence this electoral season has been in rural municipalities where gaining control over politicians is easier. “It is absurd that in many of these small communities, we have to ask for permission to run campaigns,” said Moisés Antonio González Cabañas, a professor who is competing for a seat in Guerrero’s state Congress. While much of the political violence has been concentrated in several states, no state has been untouched. On June 8, Fernando Purón, a candidate in the state of Coahuila for federal Congress, was shot to death after leaving a campaign debate in the city of Piedras Negras, on the border with the United States. He was posing for a selfie with a voter when the attacker approached and shot him in the head. Mr. Purón had been receiving death threats because he had campaigned on the promise of ending drug-related crime and was openly defiant of the state’s dominant drug trafficking organization, according to local news media. On June 9, Rosely Danilú Magaña Martínez, a candidate running for the local council on Isla Mujeres, an island near Cancún popular with tourists, was shot by gunmen while holding a campaign meeting with her staff in an office. She died two days later. In the space of a week this past month, three mayoral candidates in small towns in the western state of Michoacán were shot and killed, including Fernando Ángeles Juárez who was running for mayor in the town of Ocampo. State authorities arrested the entire police force in Ocampo in connection with Mr. Ángeles’s killing. Guerrero has been among the hardest-hit regions. At least 14 candidates and prospective candidates have been assassinated since last fall, far more than in any other state, according to Etellekt. While some of the violence in the state is related to the control of drug distribution routes and the region’s enormous opium poppy industry, the spread of small criminal groups and their incursion into local crimes has helped to spur electoral violence, local politicians say. Héctor Astudillo, governor of Guerrero State, said the growing influence of criminal gangs in local politics has undermined his own capacity to govern. In Chilapa de Álvarez, a town set among rugged hills and agricultural fields, four politicians have been killed in recent months. Among the victims were two women, prospective mayoral candidates for different parties, who were killed days apart. Three other prospective candidates for state Congress stepped aside because of threats. Rival criminal organizations competing for influence over the mayoral race were widely believed to have been behind the killings, said Jorge Luis Rendón, a candidate for federal Congress representing a district that includes Chilapa. The battle for political control in Chilapa and elsewhere in the state has become more vicious amid a plunge in the price of the opium poppy, which has forced gangs to diversify their criminal activities beyond drug trafficking, officials said. The criminals’ campaign to co-opt local politics in and around Chilapa was at first a quiet, somewhat hidden phenomenon, Mr. Rendón recalled. Now, however, it has become “more open, shameless,” he said, with gang members even dictating how entire communities should vote. 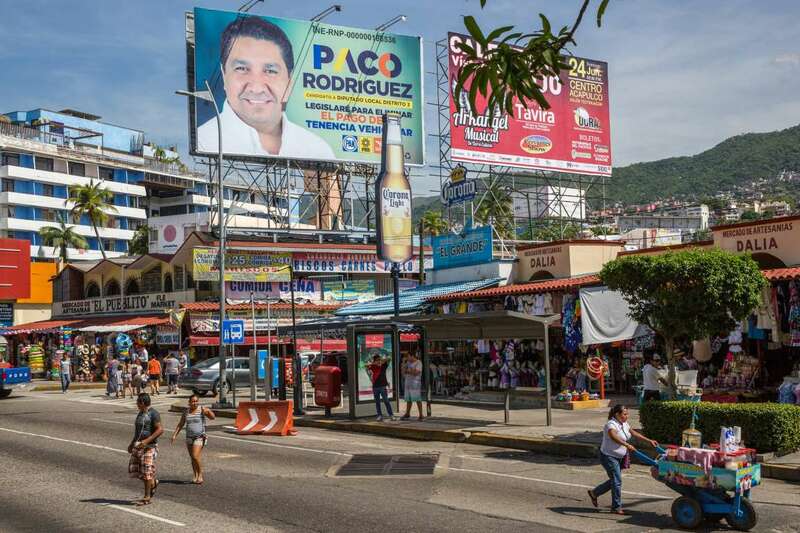 A political billboard in Acapulco. Mexicans will fill more than 3,400 local, state and federal posts in Sunday’s election. Gang members backing a specific candidate have imposed caps on how many votes opposing candidates are permitted to win, giving the appearance of democracy to the final tallies but safeguarding their candidate’s victory. Erit Montúfar, the brother of Abel Montúfar, said he had urged the candidate to renounce his bid for state Congress in Guerrero before he was killed in May. Their family was deeply involved in politics in the region, known as Tierra Caliente. When the father of four started receiving threats, his relatives grew concerned. Mr. Rendón, the local candidate in Chilapa for federal Congress, said the decision to run in spite of threats can be a bold act of conviction — at the risk that it may be your last.